While this blog is mostly about theory, today I would like to talk about a real auction and how it relates to theory. I’ll focus on a fundraising auction for my child’s elementary school. 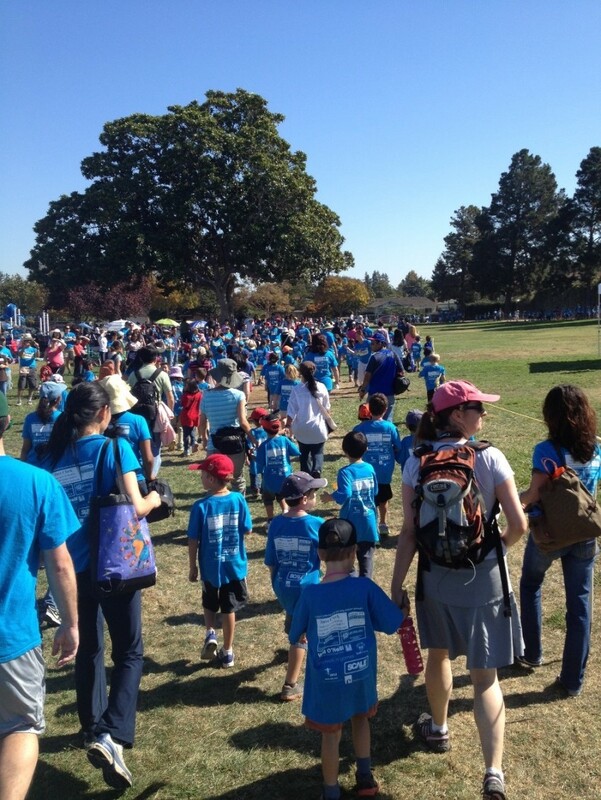 As is common around here, the school has an annual community event called a “Walk-a-Thon” in which donations are collected towards the funding of various programs such as music, band, science, arts, field trips and technology. Most of the money comes from parents (and relatives) that commit to payments proportional to the distance (number of laps) walked by their kids. The next picture shows the first lap. 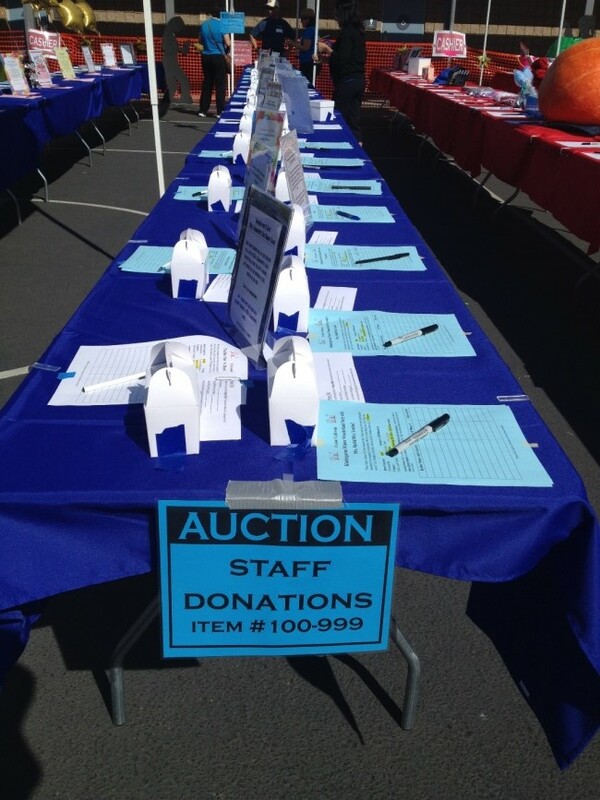 As part of the event, items are collected and are auctioned throughout the afternoon of the Walk-a-Thon day. The items presented in the auction are very diverse, and include both physical objects and services. 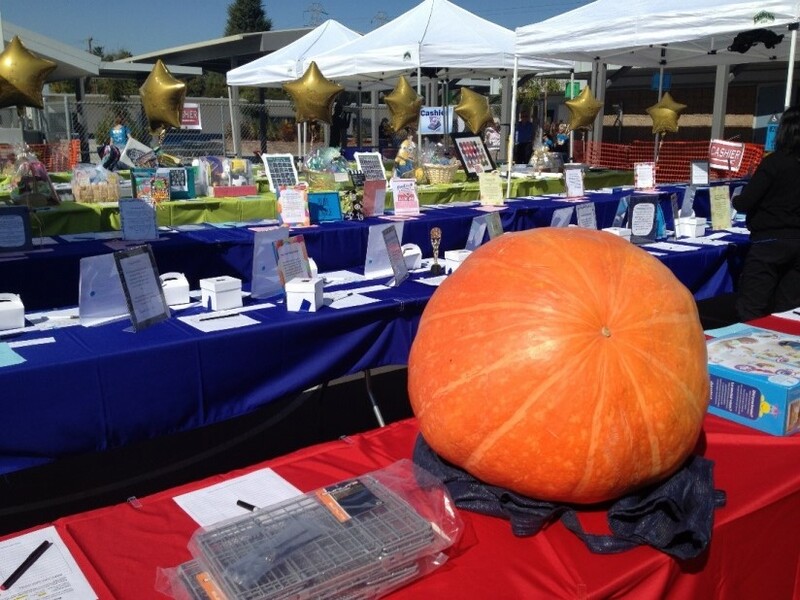 Typical items could be crafts made by the kids, parties that parents organize, events like a pizza party organized by teachers, items donated by parents as well as items donated by corporations (and even a pumpkin grown in the school’s garden). 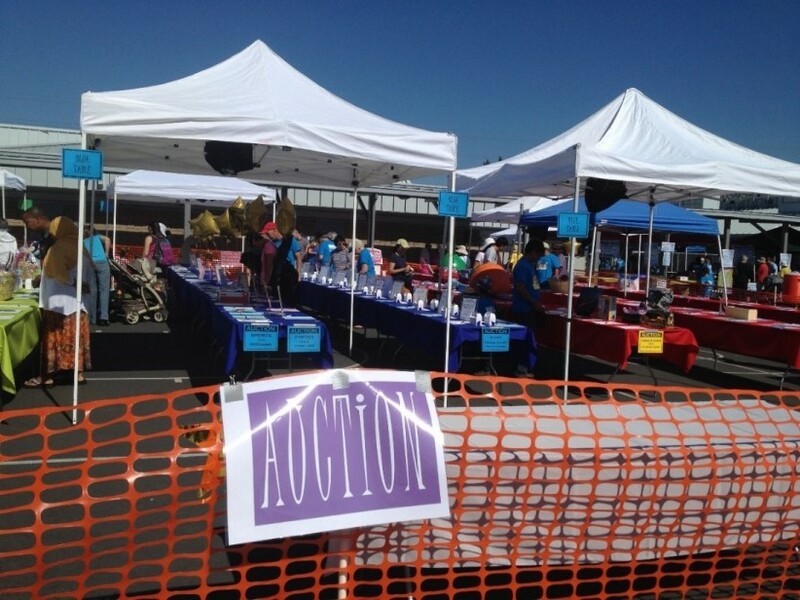 A general view of the auction. A pumpkin from the school’s garden, ready for Halloween. The first year I joined the school, the auction was running as a “silent auction” (a format used by many schools for their charity auction). The auction was about 4 hours long with a fixed end time. Items were placed on tables, each item had a bid sheet in which bidders bid (simply a piece of paper attached to the item). The highest bidder for an item wins the auction and pays his bid. Each item had a minimal bid and the bid increment was $1. Bidders were encouraged to submit multiple bids, outbidding each other. When multiple identical items were sold (like in the case of tickets to a party), the highest bidders would win the items, paying their bids. Naturally I was very interested to see how the auction performed. Looking at the auction format, one sees that this is essentially an English auction implemented using bid sheets, so at least in theory (for items with private values) one would expect the allocation to be efficient (and the same as of the second price auction). Revenue should also be very high, as long as each item has enough bidders interested in it. But when attending my first Walk-A-Thon event it was quite clear to me that this optimistic outcome was not being realized, and many prices were much lower than I would have expected. Why was this happening? What are the main differences between this auction and the clean theoretical model? The Walk-A-Thon day is a very busy day for most of the potential bidders (=parents), with many of them volunteering in various activities (like handing water bottles to the kids, or serving food) or simply taking care of the children once they become exhausted from walking. So essentially the bidders in our auction have a high cost of submitting bids, as submitting a bid requires them to leave whatever they are doing, go to the auction and find the item they are interested in, and then write their bid. All this hustle only buys you one bid, while an English auction requires you to keep coming back to the auction and submitting bids until the auction ends or someone bids above your true value. Another fundamental difference is that it is not clear that the private value model holds for some of the items (e.g., when the item is a $50 voucher for a restaurant). Moreover, it is not clear that bidders in a charity auction aim at maximizing their utility in the standard way. Perhaps they have a fix amount of money they want to spend and will maximize their utility given that they exhaust their budget? Finally, the value of some items (like party tickets) depend on whether the same group of friends manages to secure enough tickets, so there are plenty of externalities. Some people have realized that there is no reason to be active until the last minute, and have used the “sniping” strategy: bid at the last minute just as the auction closes (this strategy is well documented in online bidding). With many occupied with other things, only few people were able to execute this strategy and there were no last minute bidding wars, and the lack of competition resulted in low prices. It seems as though when people did submit bids earlier, many were basically bidding just $1 above the previous highest bid and not more than that, and many never came back to bid again. While this seems not very rational for a bidder that knows that he might never return to submit another bid, large jumps in the bids were very rare. So how could the revenue of the auction be increased? It seemed to me the main goals should be to decrease the cost of bidding and increase the participation rate. A natural solution is to have a sealed bid second price auction on each item, thus eliminating the need to bid multiple times on each item. This idea was not adopted by the organizing committee as it seems like such a big change might be confusing for the bidders, and the auction committee preferred incremental changes (here’s a constraint that is very rarely put into a formal model, yet exists in many real auctions, including large scale internet auctions). The ideas we came up with will not surprise anyone that is familiar with eBay’s auctions. Instead of moving all bidders to the new auction all at once, the changes will allow “traditional” bidders to continue as before and not do anything new, while allowing (but not mandating) more exploratory bidders to try new options. In the following year we implemented two changes. First, for some items we have added a “buy–it-now” (BIN) price. People could still bid for the item on the bid sheet, but could also buy the item at any time during the auction for the BIN price, and take the item off the auction. The BIN option worked very well. It was extensively used by people that wanted to secure the acquisition of the items immediately as the auction opened. That option worked particularly well for parties, as it allowed buyers to coordinate: people would buy tickets together with friends (their valuation had significant positive externalities; and unlike in the auction, with BIN it was easy to guarantee that some set of bidders win together). Of course one has to set a proper BIN price, and that is a non-trivial task. Although the BIN prices we have posted were much higher than the selling prices in the previous year, the first year we have added BIN for parties, tickets were taken off the auction almost immediately. We raised the price in subsequent years and the result is that we almost quadrupled the revenue from one of the parties! In general it is hard to know how to set the BIN price. One would like to update the BIN price of sold out items in future auctions, but by how much? A possible solution is to sell some of the identical items with BIN and others in the auction, but that was determined to be too complicated by the committee. Another benefit of using BIN is that more people are paying for items throughout the auction and not at the end when there are crowds in line for payments. This further reduces the indirect costs of participating in the auction and is significant when running this kind of physical auction. In the last 3 years we added BIN options to more and more items, mainly of high value, and essentially all parties. For most party tickets with BIN option we have observed that usually all tickets were sold at the BIN price, although we have consistently increased the BIN price every year. The second change we introduced was the addition of Proxy bidding for some of the items. Proxy bids are submitted in a sealed box and are secret (see picture for the table with the boxes). People can still bid on the bid sheet, but the highest of all bids (proxy or open) wins. A proxy bidder that wins pays the minimal amount needed to win. This option is an incremental step towards having a sealed bid second price auction. This option was mainly useful for people that were busy with other activities during the day, and was used extensively and resulted with much more aggressive bids than the open bids, and almost always won the auction. Surprisingly, open bids were still used for items with the proxy option. The auction table, with both bid sheets and boxes for Proxy bids. While proxy bidding are trivial to implement in an electronic system, there are surprising complications when they are done in a physical auction. Once the auction ends, people immediately want to know whether they won, and pay for the item, and it requires some time to manually handle proxy bids. Nevertheless, this option was successful and was adopted extensively, mainly for items of unclear (and private) value, like participating in a party with the teachers. Two other changes we made were aimed directly at accelerating the auction and decreasing the overall cost of bidding. First, we increased the reserve prices. Second, we increased the bid increment from $1 to $5 on items of high value. Both changes seem effective. So what have we learned? In the physical world, implementation issues can cause big gaps between the basic theoretical model and practice. Understanding the reasons for these gaps enabled us to make a set of changes that were very effective, and increased the revenue considerably. This was achieved although we do not have a complete theoretical understanding of people’s behavior in this auction, and thus are unable to come up with the optimal auction. Thanks Dahlia! I completely agree that some of the bidders are not bidding like the simple utility maximizing bidders we are used to think about. The main goal of the changes we have made was to minimize the social costs (the wasted effort of people that come to bid only to be outbid later), and increase the total welfare. That seems like an improvement step in any case, independent of the exact behavior of the bidders, which we do not completely understand (as you have pointed out).